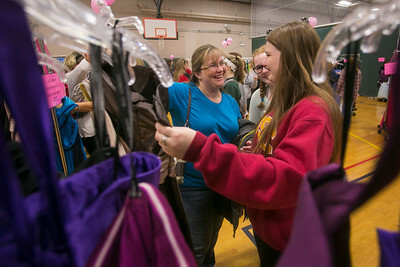 Daryl Quitalig - For Shaw Media Marcy Cronin (left), of Wauconda, picks out a dress for one of her daughters to try on at My Sister's Dress at Sage YMCA in Crystal Lake on Saturday, March 7, 2015. The ladies attended because it would be a way to have fun while shopping for a prom dress. My Sister's Dress is a fundraiser for Big Brothers Big Sisters of McHenry County. Gently used dresses were donated and sold for girls going to prom. Girls can get a dress for $25 or jewelry, purses and other accessories for $5, saving quite a bit on the total cost. The money raised Ð typically about $3,500 each year Ð is gifted to Big Brothers Big Sisters of McHenry County, said Lake in the Hills resident Emily Smith, co-founder and chairwoman for the event. 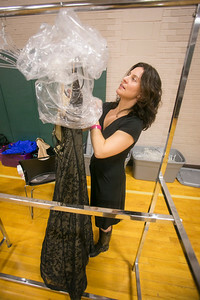 Daryl Quitalig - For Shaw Media Denise Smith, My Sister's Dress Committee Member, of Crystal Lake, bags a purchase at My Sister's Dress at Sage YMCA in Crystal Lake on Saturday, March 7, 2015. My Sister's Dress Is a fundraiser for Big Brothers Big Sisters of McHenry County. Gently used dresses were donated and sold for girls going to prom. Girls can get a dress for $25 or jewelry, purses and other accessories for $5, saving quite a bit on the total cost. The money raised – typically about $3,500 each year – is gifted to Big Brothers Big Sisters of McHenry County, said Lake in the Hills resident Emily Smith, co-founder and chairwoman for the event. 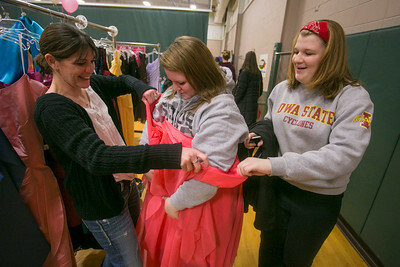 Daryl Quitalig - For Shaw Media Kelly Cronin, 17, tries on a dress over her clothes with the assistance of her mother Tracy Cronin (left) and cousin Hannah Cronin, 17, all from Wauconda, at My Sister's Dress at Sage YMCA in Crystal Lake on Saturday, March 7, 2015. My Sister's Dress Is a fundraiser for Big Brothers Big Sisters of McHenry County. Gently used dresses were donated and sold for girls going to prom. Girls can get a dress for $25 or jewelry, purses and other accessories for $5, saving quite a bit on the total cost. The money raised – typically about $3,500 each year – is gifted to Big Brothers Big Sisters of McHenry County, said Lake in the Hills resident Emily Smith, co-founder and chairwoman for the event. Daryl Quitalig - For Shaw Media TJ Tryba, 15, and Cole Issleb, 16, both of Island Lake, burn the time as Tryba's sister/Issleb's girlfriend, Taylor (not pictured), tries on a dress in the back area at My Sister's Dress at Sage YMCA in Crystal Lake on Saturday, March 7, 2015. My Sister's Dress Is a fundraiser for Big Brothers Big Sisters of McHenry County. Gently used dresses were donated and sold for girls going to prom. Girls can get a dress for $25 or jewelry, purses and other accessories for $5, saving quite a bit on the total cost. The money raised – typically about $3,500 each year – is gifted to Big Brothers Big Sisters of McHenry County, said Lake in the Hills resident Emily Smith, co-founder and chairwoman for the event. 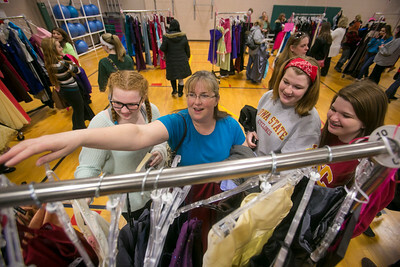 Daryl Quitalig - For Shaw Media Marcy Cronin (second from left), of Wauconda, picks out a dress for one of her daughters to try on at My Sister's Dress at Sage YMCA in Crystal Lake on Saturday, March 7, 2015. The ladies attended because it would be a way to have fun while shopping for a prom dress. My Sister's Dress is a fundraiser for Big Brothers Big Sisters of McHenry County. Gently used dresses were donated and sold for girls going to prom. Girls can get a dress for $25 or jewelry, purses and other accessories for $5, saving quite a bit on the total cost. The money raised – typically about $3,500 each year – is gifted to Big Brothers Big Sisters of McHenry County, said Lake in the Hills resident Emily Smith, co-founder and chairwoman for the event. 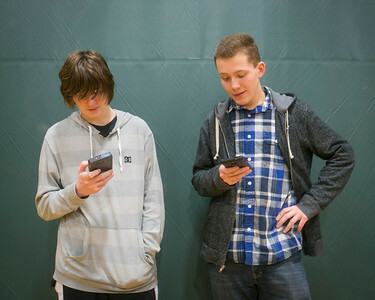 TJ Tryba, 15, and Cole Issleb, 16, both of Island Lake, burn the time as Tryba's sister/Issleb's girlfriend, Taylor (not pictured), tries on a dress in the back area at My Sister's Dress at Sage YMCA in Crystal Lake on Saturday, March 7, 2015. My Sister's Dress Is a fundraiser for Big Brothers Big Sisters of McHenry County. Gently used dresses were donated and sold for girls going to prom. Girls can get a dress for $25 or jewelry, purses and other accessories for $5, saving quite a bit on the total cost. The money raised – typically about $3,500 each year – is gifted to Big Brothers Big Sisters of McHenry County, said Lake in the Hills resident Emily Smith, co-founder and chairwoman for the event.